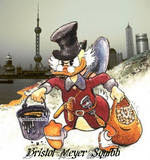 Bristol-Meyer Squibb can donate to the Disaster Relief in Haiti, But can’t donate to the citizens in the United States that need it the most, the Melanoma Cancer Patients that are fighting for survival and don’t qualify for BMS’s Trials. These are the cancer patients that are falling through the Healthcare system cracks. Jumping on the band wagon to get some extra PR is not the way to try to bolster their image. I believe in helping Haiti, but also Charity should start at home. Are they doing to for Humanitarian reasons or is it a just a big brand recognition scheme? I believe it is for the PR. What really happened with the Compassionate Drug care use for Melanoma Patients? They said as of 9-12-2008 that they had to stop the use because they were having trouble manufacturing it. I believe it was all a cover up. As of 9-12-2008 they have opened quite a few new Clinical Trials with Ipilimumab. Then they pointed to a new process. There is one problem I see here. It only takes 3 months to grow the antibodies. They already had the master seed vials from Medarex. It is a Batch fermentation process or a continuous feed process. At the most it should take 4 to 5 months with testing and Good GMP. So about 18 months have elapsed since the stoppage and we still have no Compassionate Drug use. That means at least 3 to 4 batches were made. We confirmed at least one or two batches based on information from some Melanoma non-profit organizations. Bristol-Meyer Squibb, If there was truly a Shortage/problem in the production of Ipilimumab, the it would show up in the Master Production Batch Record (MPBR) or Production Batch Record (PBR). They won’t respond because there was not incident. The reason they shut it down in my opinion was, they were loosing money giving it away. It was not in the plan “Sting of Pearls”, and since it was going to take longer to get it FDA approved, they wanted to stop the outflow of revenue. As of 1-29-2010, I am still getting lip service from Bristol Meyer Squibb. “In light of the previous demand, Bristol-Myers Squibb is committed to ensuring that a continuous supply of ipilimumab is available prior to the re-opening of compassionate use so there are no treatment interruptions for patients who initiate therapy. As you probably know, the manufacturing cycle time and testing of a biologic such as ipilimumab is more complex than what is traditionally seen with small-molecule synthetic chemical pills. For example, host cells need to be grown, the purification process requires several steps before the active pharmaceutical ingredient can be formulated and the complexities associated with the manufacturing process limit the amount of drug supply that can be produced at one time. For more information on the manufacturing of biologics, please visit the Biotechnology Industry Organization's website at: http://www.bio.org/healthcare/pmp/factsheet1.asp. It is taking way to long for this drug to come to market. It was discovered over 10 years ago by Dr. Jim Allison at USC. So we could be another year or two before they go infront of the FDA. Many Melanoma Patients will die in the meantime. It will be blood on the the Hands of Bristol-Meyer Squibb. Greed has over taken compassion. Just look at the graphic they put up at one of their financial meeting. They know what they have. They realize what they are holding in their Drug Pipeline. Scientists at Emory Vaccine Center are providing new insights into the role of interleukin 2 signaling on the differentiation of T cells into long-lived memory cells as a result of an acute infection. They conclude that their results uphold previous, contradictory hypotheses suggesting that IL-2 can have both positive and negative effects on CD8+ memory T cell development. The team, led by the vaccine center’s director, Rafi Ahmed, Ph.D., followed the kinetics of CD25 expression on T cells in mice infected with lymphocytic choriomeningitis virus; CD25 is the alpha chain of the IL-2 receptor. They then determined the fate of CD8+ T cells expressing differential levels of CD25. 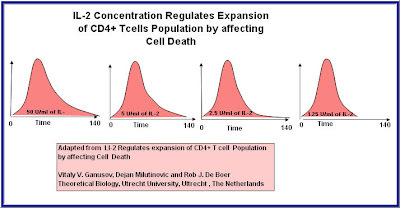 They found that while all CD8+ T cells upregulated the expression of CD25 similarly as an immediate response to infection, after a few days the T cells could essentially be separated into two groups, one displaying high levels of CD25, and the other low levels of CD25. It was the low-level CD25 T cells that appeared to differentiate into functional long-lived memory cells. These cells were less sensitive to IL2. Conversely, T cells expressing high levels of CD25 and exposed to prolonged IL2 signals proliferated more rapidly into effector cells and were far shorter-lived. Interestingly, when mice were given extra IL2, the T cells exhibited more pronounced effector characteristics. As the infection began to clear, all the T cells subsequently reduced their levels of CD25 expression until there was no evidence of any difference in levels of the molecule. The authors suggest their observations combined with previous findings by other researchers, suggest that too little as well as too much IL2 can be detrimental to the development of immunological memory. This is what I postulated in my paper "Melanoma and the Magic Bullet"
IL-2 concentration in vivo Matters!!!!!!! Leading melanoma experts will discuss emerging therapies, the importance of clinical trials, and innovations in research. A Q&A Session will follow. This really crushes me. I was hoping this would be the beginning of the end for melanoma. Maybe it will with time and more research though. I am not saying this will apply to anyone or everyone, but I think it is important that everyone needs to read this. My 39-year-old husband is (as far as I know) the first U.S. patient to be in the Phase II BRAF-inhibitor trial funded by Roche Labs (partnering with Plexxikon). This trial uses the drug alone, without an arm that might include chemotherapy drugs (like the Phase III). He is on 960 mg twice aday of the drug, the highest tolerated dose. We are being treated at Moffitt in Tampa. Clint began the trial the first week of October, about 15 weeks ago. We were astounded with the positive results and almost non-existent side effects (loss of body hair and mild muscle fatigue). That is, until last week, when the drug (PLX 4032/RO5185426) seems to have abruptly stopped working. After much research we are learning that this is perhaps not an unexpected response. From my most recent reading it seems that for patients who are positive for the BRAF mutation (70% of melanoma patients), the BRAF-inhibitor may be necessary but not sufficient to create long-term effects. In my husband's case, we had genetic testing that determined the only mutation of note that could cause melanoma is the BRAF V600E mutation. But once he began the BRAF-inhibitor, the cancer seems to have created a new pathway around the drug. We will know shortly whether my husband's body has created new mutations and if so, which ones. We are therefore, scrambling to find a new study that uses a combinatorial therapy of BRAF-inhibitor and MEK/RAS inhibitor (depending on what, if any, new mutations Clint has). I believe this combo therapy is likely to be the new frontier, and is already being studied in many places, including Australia and England. There is a combinatorial trial preparing to open in Nashville, TN, and I've got a call into their office to find out when. Now that the BRAF-inhibitor seems to have stopped working for my husband, we are in a race against the clock to once again stop his extremely aggressive, fast-moving disease. In no way do I wish to "pull the rug out from under" any of you who are fortunate enough to be a patient on a BRAF-inhibitor trial. It has been an amazing drug! But I want to make sure we get our experience out there because we were very frustrated to not be given full disclosure about the likelihood of the disease finding new pathways. We had specifically asked our oncologist about a Plan B if the drug stopped working and he was dismissive of our question. Now that we are in this scary place of seeing the disease quickly progress again, we have learned that the melanoma is now in his brain. This precludes Clint from most other clinical trials. If we had not let our guard down and had been looking ahead to combinatorial therapies, it would have made a big difference. This is an indication that over time, Melanoma can mutate and change pathways to escape the immune system. As doctor's search for a cure, the BRAF therapy may end up as a "bridge therapy". Bascially something to fill in why they continue to look for more treatments. I myself believe that the best way to overcome Melanoma is to use your own immune system.It can be done using a combination approach. Interferon,DTIC,Patrin-2,radiation,Anti-CTLA-4 and Interluekin-2. It is like a bicyle lock, you have to know the combination and proceed in the right order. The number of turns to the right or left corresponds to the doses and concentration. Here is the combination, Good Luck!!!!! As I continue my search for the Holy Grail, I need to keep grounding myself to what really took place in the Melanoma treatment. I can not keep wondering if Interferon therapy had played a part in our successful treatment. Both Vicky and I did some IFN therapy first. 4) High-dose iv interferon all of July 2006, followed by subcutaneous interferon MWF for 2 months. 5) Enroll in anti-CTLA-4 study as adjuvant therapy for stage 3 MM with Dr. Jeffrey Weber at USC. 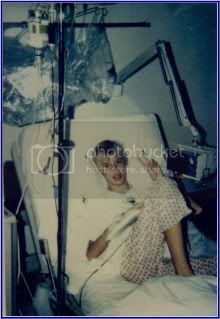 First dose of intravenous infusion of anti-CTLA-4, dose of 10 mg/kg early Nov 2006, second dose was Jan. 9, 2007. 10) Second course of IL-2 in June 2007 ( I believe I got 14 of 14 doses during the 3rd cycle or week 1 of the second course. 12) Took an elective 5th cycle of IL-2 in early September of 2007- got quite sick and stopped. I think I got around 9 doses that last time. I also did some rounds of IFN before Anti-CTLA-4 and HD interleukin -2. I had an added therapy and that was with DTIC + Patrin-2. It reviewed the biology of interferon. Once I read it, it dawned on me that Interferon alpha may have played the most important part of our treatment. It was the stage manager, who set the major histocompatibility complex molecules (MHC) in place. Without the upregulation of the correct MHC presented, the cytotoxic T cells (CTLs) would not know where the tumor target was. 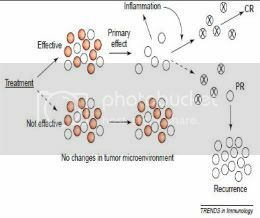 Higher MHC I expression increases presentation of tumor peptides to cytotoxic T cells, while the immunoproteasome processes tumor peptides for loading onto the MHC I molecule, thereby increasing the recognition and killing of infected cells by T cells. 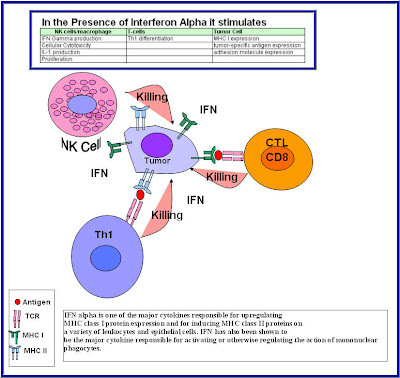 Interferon also activated the NK cells and macrophages. They inturned secreted IFN gamma which upragulated MHC II for the CD4 helper cells. I postulate that IFN therapy prior to the Anti-CTLA-4 and HD IL-2 had synergistic effect on the overall treatment that Vicky Bucay and I had. be the major cytokine responsible for activating or otherwise regulating the action of mononuclear phagocytes. Thanks to CureHunter, I now have Data Mining Capabilities. Many thanks to Judge Schonfeld for the tools to continue the research On Melanoma. I am happy to support both your goals to help other patients and continue your own research and fight with Melanoma with a free subscription to the CureHunter Professional Research Interface. You will be fully enabled with the same access that physicians and scientists around the world have by 12:00 pm PST today. There is so much poor or biased health information on the web, that raising the profile of real science is always a good deed. on the black header bar to begin. Enter Melanoma in the query field, select specific type, and click: Data and graphs will auto populate your screen. Brochure with other views of the system's core utility and functions. You probably don't know this, but CureHunter was built by a single family of scientists in memory of my brother Dr. Gene Schonfeld, Ph.D., who founded the first on line patient organization for those with terminal disease--including himself--1989, Kidney Cancer Association. I don't know how technical your own research background is, but last year my son Dr. Justin Schonfeld, Ph.D. Computational Biology, was invited to give his 4th university lecture on the CureHunter machine's ability to autonomously discover new cures for human disease in experimental settings. The video explains how Network Graph Theory (a type of math for relating massive numbers of variables-- not unlike modeling social networking on the Internet itself) is used in CureHunter to discover functional clinical networks that illuminate potential new pathways and molecules for cures: TCP in our jargon = Transmissive Curative Packets. Lastly, I have attached a copy of the Poster from my National Science Foundation conference presentation (2007) on the general systems biology theory of CureHunter, its plan to "instrument" biomedical knowledge, make it usable at the point of clinical care, and document results for all patients. Please feel free to share any of the content of this note or the attachments with those you believe would be interested. My best wishes to you and your family and thank you for fighting too. Everyone who does, helps us all by good example. Thank you for writing to the Food and Drug Administration (FDA). This is in response to your electronic inquiry dated November 10, 2009, to Dr. Margaret Hamburg, Commissioner, concerning the access to ipilimumab for compassionate use. Your letter was forwarded to my office in the Center for Drug Evaluation and Research (CDER) for a response. Apparently, the drug's sponsor (BMS) has suspended their Treatment investigational new drug application (IND) because of inadequate supply of the drug. All of their production is being funneled to their clinical trials. There were a number of individual patient protocols providing treatment access outside of the clinical trials. FDA and the company worked together to consolidate the individual INDs into a Treatment IND, but then found that demand was outstripping supply. So, currently, there is apparently no expanded access program ongoing. FDA does not have authority to require the company to provide the product outside of their trials. Generally, it's more advantageous to dedicate limited product to clinical trials to establish safety and effectiveness and get the drug to market to provide the widest patient access. Unfortunately, the FDA cannot readily affect a company's decision to provide patients with continued access under the Treatment IND. The only real option is to contact the sponsor to convince them to consider reinstating an access program for desperately ill patients. The agency can make the regulatory pathway to access available, but the decision to produce and distribute the product lies solely with the sponsor. Wish we could have been more help. Eureka!!!!!! A possible cure for Melanoma, the Deadly Skin Cancer. Cytotoxic T Lymphocyte-Associated Antigen 4 (CTLA4) is a protein involved in T-cell expansion or replication and activation in response to an immune event. Following T-cell stimulation, T-cell proliferation is up-regulated. Following successful response, CLTA4 is also up-regulated, which then sends an inhibitory signal to down-regulate or decrease T-cell proliferation and IL-2 production. This is one of the brakes associated with immune system so it won’t go into overdrive and create a possible autoimmune event. In the presence of the tumor’s microenvironment, the CTLA4 molecule is upregulated on the T-Cells with the help of TGF-beta, a suppressive Cytokine secreted by the tumor cells. TGF-beta requires CTLA-4 early after T-Cell Activation to Induce FoxP3 and generates adaptive CD4+CD25+ Regulatory Cells. et al Song Guo Zheng and colleagues. If you add the combination of IL-2 and TGF- beta at the beginning of the treatment, it induces naive or total CD4+CD25– cells to develop strong suppressive effects both in vitro and in vivo according to Horwitz et al 2001. 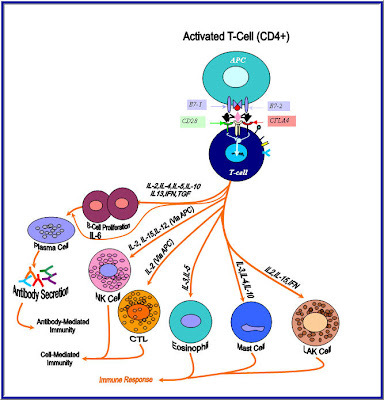 The T-Cell differentiation is pushed towards developing Treg suppressive immune cells. Anti-CTLA4 monoclonal antibodies block the ability of CTLA4 molecule to down-regulate T cell proliferation. The theory behind this therapy is that by decreasing the inhibitory signal, there will be a subsequent increase in the number of activated T-cells available, to improve the ability of the T-cells to recognize melanoma cells as non-self. 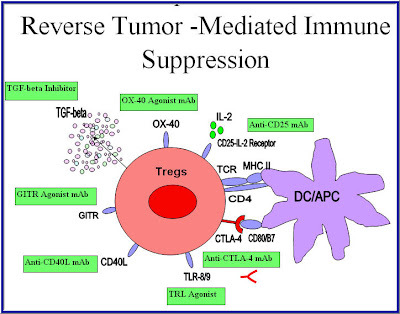 Tregs show remarkably suppressive activities on different components of the immune system, including T lymphocytes and dendritic cells, suggesting they act both at the initiation phase (DC) and at the effector phase (activated T cells) of the immune response. Interestingly, temporal depletion of Treg has been shown to enhance anti-tumor immune responses and in case of prolonged absence of Treg even autoimmunity. CTLA-4 blockade in cancer immunotherapy. 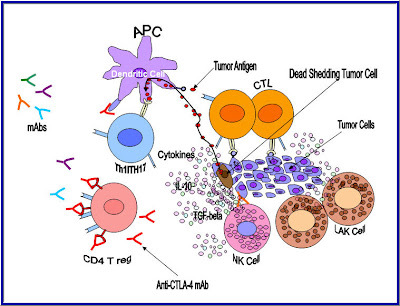 Dendritic cells can sample tumor antigens and present them to T cells. (A) Although activation of dendritic cells may result in upregulation of B7.1/B7.2, the potentially responsive T cells expressing reactive TCR may be inhibited from effector function by inhibitory signaling via CTLA-4 and PD-1. Blockade of CTLA-4 signaling may allow unopposed CD28 costimulation, resulting in recruitment of these T cells as antitumor effectors, either directly or as helpers of CD8-mediated T cells responses. 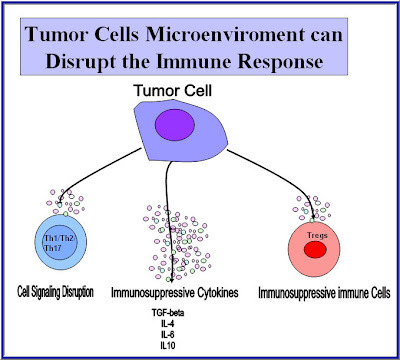 Activated cytotoxic T cells can then affect antitumor responses. CTLA-4 expressing regulatory T cell populations may still be locally active in suppressing antitumor responses. 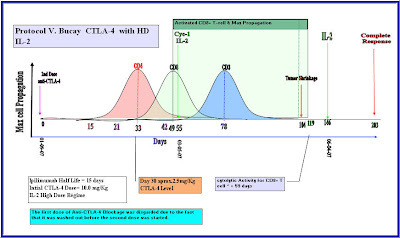 Their activity could also be directly downregulated by CTLA-4 blockade, although the relative importance of CTLA-4 expression to their function remains controversial. Recent research by Probst et al reveal that resting dendritic cells induce peripheral CD8+ T-cell tolerance through the PD-1 and the CTLA-4 molecule/surface receptor. Blocking the costimulatory molecule CTLA-4 resulted in breaking the tolerance. A well Orchestrated Event, your immune system in action. • Early after the CD4+ T-cells are activated, the CTLA-4 receptors are upregulated according to the research. 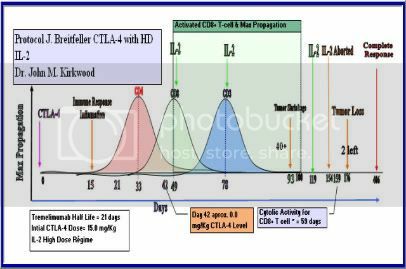 • TGF- beta requires CTLA-4 upregulation early after T Cell Activation to Induce FoxP3 and generate adaptive CD4+CD25+ Regulatory Cells. Song Guo Zheng et al and colleagues. • If you add the combination of IL-2 and TGF- beta at the beginning of the treatment,it induces naive or total CD4+CD25– cells to develop strong suppressive effects both in vitro and in vivo according to Horwitz et al in 2001. Here are some other papers I have written that puts the Melanoma Therapy into perspective. Immunotherapy has emerged as the most effective treatment for patients with metastatic melanoma. 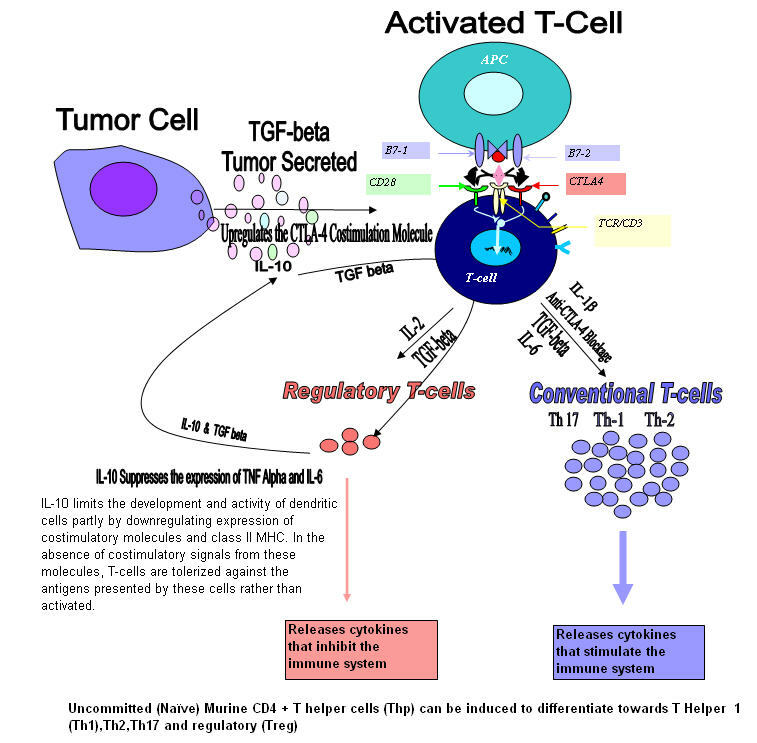 Much of the information concerning the immune response to melanoma has come from the study of tumor-infiltrating lymphocytes (TIL), immune cells that infiltrate into the stroma of the growing tumor and can be grown in vitro in the cytokine IL-2.1 TIL have been used to identify dozens of antigens that are presented on melanomas.2 Some antigens such as MART-1 and gp100 are shared by both melanomas and normal melanocytes, whereas others, such as NY-ESO-1, can be expressed on melanomas, but on no other adult tissue except the testes. Most studies of immunotherapy for melanoma patients have been directed at those with metastatic disease. Although multiple trials of cancer vaccines have been performed in patients with resected lymph nodes at high risk of recurrence, none of these clinical trials have convincingly demonstrated prolonged survival.3 Some controversy exists surrounding the use of interferon alpha for the treatment of stage 3 melanoma; prolonged follow-up of patients in prospective randomized trials has yielded ambiguous results, and many oncologists are concluding that the toxicities of highdose interferon are not warranted given the lack of conclusive evidence of effectiveness in this setting. Newswise — A specific type of T helper cell awakens the immune system to the stealthy threat of cancer and triggers an attack of killer T cells custom-made to destroy the tumors, scientists from The University of Texas M. D. Anderson Cancer Center report in the early online edition of the journal Immunity. The role of Th17, one of only four known types of T helper cell, opens a possible avenue for overcoming cancer's ability to suppress or hide from the body's immune system, said senior author Chen Dong, Ph.D., professor in M. D. Anderson's Department of Immunology. Dong and colleagues found that Th17 stifled development of metastatic melanoma tumors in the lungs of mice. "While there is much work to be done, these preclinical findings imply the possibility of taking a patient's Th17 cells, expanding them in the lab, and then re-infusing them as treatment," Dong said. 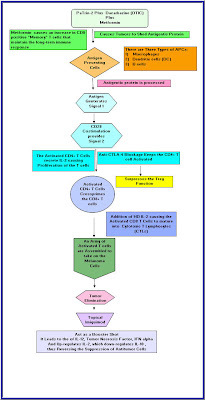 Development of a vaccine to stimulate Th17 cells would be another possible application. 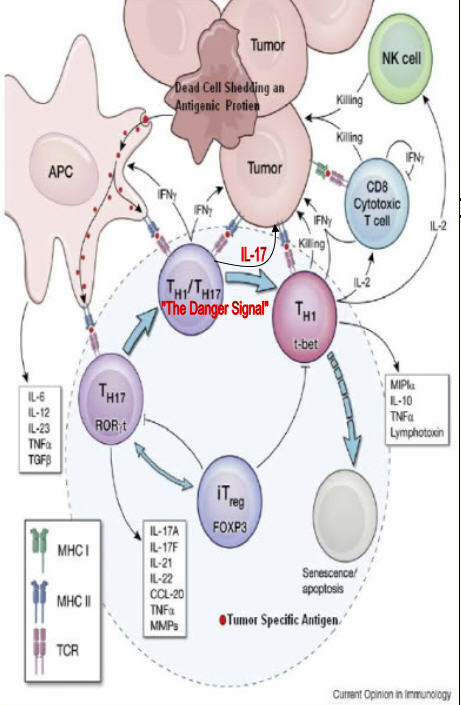 Dong earlier discovered the existence of Th17 cells and established that they secrete the inflammatory protein interleukin-17 (IL-17). His lab showed that overexpression of IL-17 contributes to both autoimmune and inflammatory diseases. "Th17 cells also are found in a variety of solid tumors and we wanted to know whether these cells promote cancer or play a preventive or protective role," Dong said. Their research showed that mice made deficient in Th17 cells and then injected with a strain of melanoma that gathers in the lungs experienced aggressive cancer growth compared to mice with normal levels of Th17. At 16 days, tumors in the knockout mice had fused together and coated the lung so extensively that they were no longer countable. Next, they tested Th17 for preventive effect, injecting Th17 cells primed with tumor-specific antigens and the melanoma cells at the same time. At 16 days, mice with Th17 had low or barely detectable levels of cancer while control mice had a heavy tumor burden in their lungs. A third set of experiments tested a treatment effect, showing that mice injected with Th17 after they already had melanoma in their lungs had a 75 percent reduction in tumor burden compared with normal mice. In all experiments, mice with Th17 also had higher levels of several categories of immune system cell than did those with normal or suppressed Th17. T cells are lymphocytes, a type of white blood cell produced by the thymus equipped with receptors that recognize and bind to antigens, pieces of invading organisms presented to the T cells by dendritic cells. The bound antigen converts the T cell to T helper cells that secrete signaling molecules called cytokines to launch an appropriate immune response. Helper cells, in effect, guide the adaptive immune response. 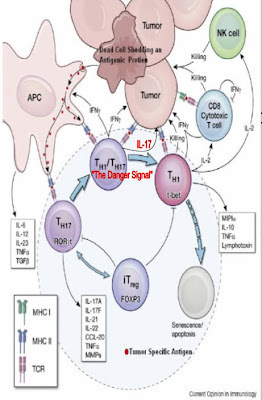 * Tumor invasion of the lung attracts Th17 cells that secrete IL-17A. * IL-17A in turn promotes the secretion of two chemokines, CCL2 and CCL20, which recruit leukocytes to the tumor site. * The leukocytes include dendritic cells, which seize tumor antigens and migrate to the lymph nodes. * There, the antigens are used to prime CD8+ killer cells, which then migrate to the lung and kill established tumors. The research was funded by grants from the National Institutes of Health, M. D. Anderson's Center for Targeted Therapy, a Leukemia and Lymphoma Society Scholar Award to Dong, and a Trust Fellowship of M. D. Anderson. Co-authors with Dong and first author Natalia Martin-Orozco, Ph.D., are Yeonseok Chung, Ph.D., Xuexian O. Yang, Ph.D., and Tomohide Yamazaki, all of the Department of Immunology; Pawel Muranski, M.D., and Nicholas Restifo, M.D., both of the National Cancer Institute of the National Institutes of Health; Sijie Lu, Ph.D., of M. D. Anderson's Department of Stem Cell Transplantation and Cell Therapy; and Patrick Hwu, M.D., and William Overwijk, Ph.D., both of M. D. Anderson's Department of Melanoma Medical Oncology. As a patient/survivor/Researcher and as an American citizen, I am sending this in hopes it doesn’t fall on deaf ears. We spend billions on heath care today but the new drugs planning to come to market takes many years as you know. In Melanoma Cancer the last FDA approved Drug was IL-2 back in the eighties I believe. It Has recently come to light that a combination treatment may hold the key for a cure/stabilization. 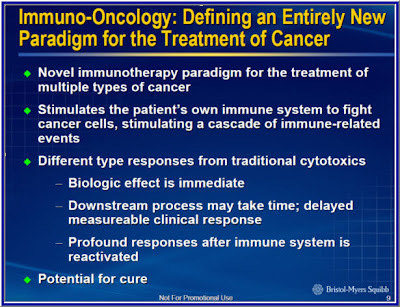 Yes, I know we are hear about the PLX-4032 (BRAF inhibitor) and Dr, Rosenberg’s trials with 36 % complete response, but using one’s own immune system to eradicate the cancer may be the best solution. 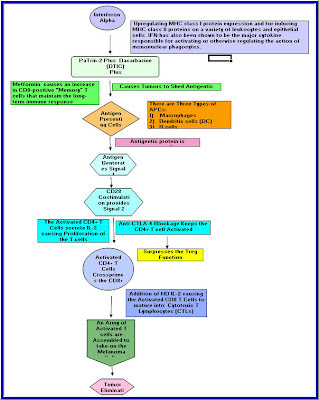 Blocking a pathway may only delay the regression and the ACT therapy is quite expensive. What I am proposing is this combinatorial Therapy. It has seemed to work for me and a couple of other patients. The problem is that all the drug companies want to use their drugs as monotherapies. There seems to be no collaboration unless they have no choice. Is there any way to get this into a Clinical Trial Format? Here are some graphics that show it s worth investigating. I need you help. I am not in it for the money, fame, etc, I am in for the ethics. It is what should be done for the whole world including USA. With the Knowledge that I have gained, I would like someone like yourself take it to the next level and run with it. I don’t have the connections that you have. I am just a retired Surface Science guy from Eastman Kodak Research labs that happen to come down with Melanoma Cancer. Dr. Rosenberg, I wanted you to know about this because your Research has allowed me to put this puzzle together. Thank you for sharing your research. Thanks for communicating with me over these years. Some researchers like to hold their cards close to their chest. I would rather show my hand to help find a cure/stabilization. I know in your Research clinical trials you are approaching 50% complete response for HLA-02 positive patients. What does that calculate out to if you include the other subtypes? 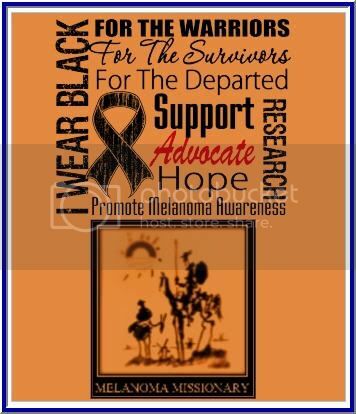 I am hoping that the information that I have pulled together will benefit the whole Melanoma community. I know that my therapy was not a one off data point and that is why I am pursuing this combination theory to the max. By obtaining the above papers, I now have real evidence of what took place with my therapy as a Melanoma patient and why it worked. The paper that I wrote called Melanoma and the Magic Bullet (Monoclonal antibodies) was right on track. I did a little bit of hand waving early on, but NOW I have the evidence that the IL-2 timing plays a critical roll in the outcome of the clinical trials. 2. 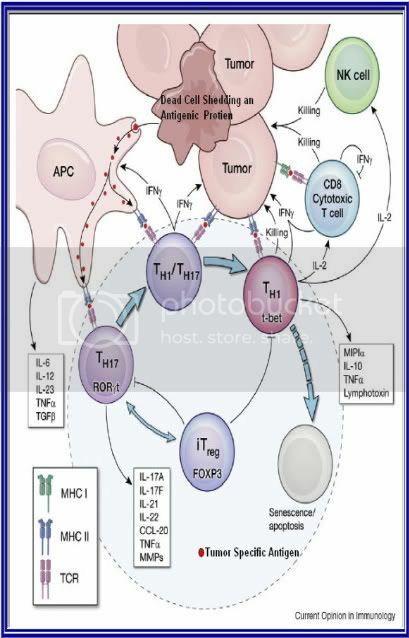 It pushes the balance of the CD4+ T-cell differentiation towards the Th17 lineage or also known as the THi cells which stands for inflammatory Cells. 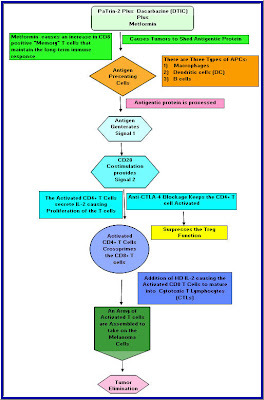 They generated the third signal “Danger Signal” which is one of three needed to activate the CD8+ T-cells. This base on research that Dr. Ribas has done. 3. It suppresses the Treg expansion/function tilting the immune response balance towards activation instead of Anergy. According to Dr. Wolchok and investigating the dose of Anti-CTLA-4 blockage recently, the higher the dose the better the immune response. The best overall response rate was 11•1% (95% CI 4•9—20•7) for 10 mg/kg, 4•2% (0•9—11•7) for 3 mg/kg, and 0% (0•0—4•9) for 0•3 mg/kg (p=0•0015; trend test). I did 15mg/Kg of Tremelimumab (one Dose) and got a COMEPLETE RESPONSE. My guess is there is threshold that is needed to broken to tip the balance of tolerance to activation. It all comes down to timing and the dose concentration. IL-2 was giving in the contraction phase of the CD4+ T-cells and at the Maxiumum growth phase of the CD8+ T-cells. It is as I refer it as the “Perfect Storm”. This is all based on a paper by Dr. Itoh and colleagues in 1988. Dr. Heryln’s Paper “Tumors as elusive targets of T-cell-based active immunotherapy. It is going to be a great 2010!!!! !